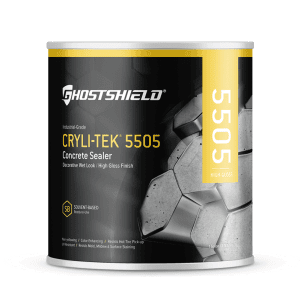 Cryli-Tek 5500 is the industry’s highest performing decorative sealer. This unique formula leaves the surface with a clear, low sheen, non-yellowing, satin finish. This product has an extremely fast set time and unsurpassed stain resistance. The treated surfaces will resist chipping, flaking, delamination and breakdown with UV light exposure. 1 Gallon Coverage: Up to 250 sq. ft. This covered so well and so quickly! Great product. I got this very quickly it doesn’t go as far as it says it will but did a great job of sealing our concrete sun room floor, the finish was a subtle sheen. This sealer works as advertised. Made my customers all brick entry way look new again. We just shook the bottle a bit, poured it in the sprayer and gave the entry way one coat as directed. It brought out the depth and color of the brick, and the neighbors are impressed too. Being the only exterior water based product I like, and the price is right, you have to try it for yourself, it’s a great product. Was going to buy 3 gallons but with the 15% discount on 4 it was better to go with that option. This is by far the cheapest place to buy this sealer, I shopped around all the other retailers and none of them could compete. can be used in California which was why i order it. not a matte finish more of a satin. Manufacturer advertises this as matte finish product but I have to say it is definitely more of a satin finish which I actually prefer.